Review: 2013-05-04, pretty good finish and two knockdowns between Wladimir Klitschko and Francesco Pianeta but it is not enough to get three stars. Wladimir Klitschko (59-3-0, KO%=80% since he has 50 victories coming by way of knockout) entered as the No.2 heavyweight in the world while the undefeated Francesco Pianeta (28-0-1, 15 KOs) entered as the No.15. 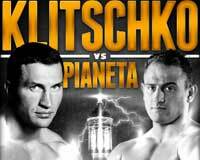 Klitschko vs Pianeta is valid for the WBA, WBO, IBF and IBO heavyweight titles. Watch the video!